Memorial Day events are planned across county, including Forest Grove, Hillsboro and Banks. Whether you're in Hillsboro, Banks or Beaverton, there's plenty to see and do this Memorial Day. The federal holiday pays tribute to those who died serving in the U.S. military, and several groups will gather on Monday, May 28, to show their respects. VFW Post No. 2666, American Legion Post No. 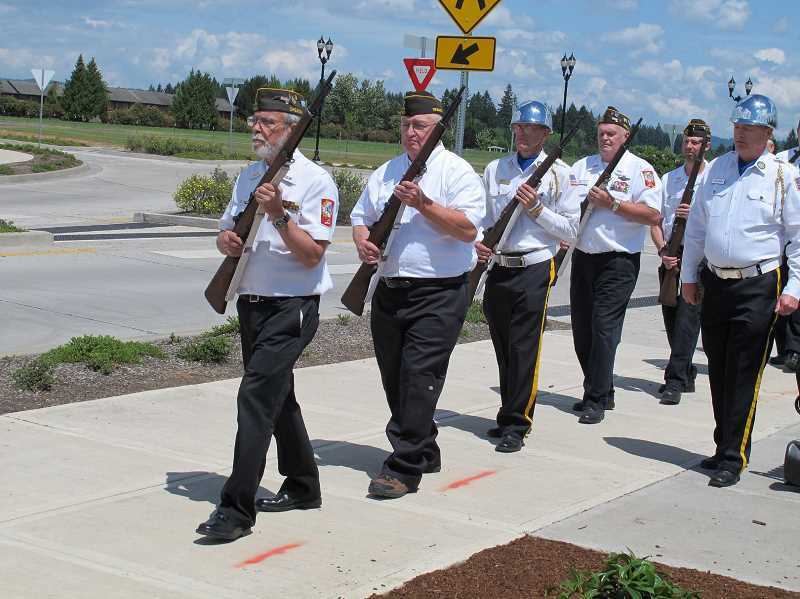 6 and the Washington County Disability, Aging and Veteran Services will host the annual Memorial Day ceremony on Monday, May 28, at the Veterans Memorial Gateway, at the corner of Northeast 34th Avenue and Veterans Drive in Hillsboro. The ceremony starts at 1 p.m.
From 11 a.m. to 1 p.m., community members are welcome to enjoy the patriotic music of the Hillsboro High School Jazz Ensemble and the Missbehavins. Veteran organizations will also be on-hand to provide information about their groups. The event will take place rain-or-shine, with covered seating available. Attendees can park in TriMet's lot at the Fair Complex/Hillsboro Airport station. For more information, call Washington County Disability, Aging and Veteran Services at 503-846-3051. A Memorial Day ceremony will be held at Valley Memorial Park and Funeral Home located at 3929 Southeast Tualatin Valley Hwy in Hillsboro on Monday, May 28 at 2 p.m. Open to the public, the Clan Macleay Pipe and Drum Band will be performing, Chaplin Steve Brodehl with the Hillsboro Police and Fire Department will be officiating and guided nature walks will take place after the ceremony. The American Legion Washington Post No. 2 and Oregon Army National Guard in Forest Grove are sponsoring a Memorial Day ceremony at 11 a.m. at Forest View Cemetery, 1611 W. Pacific Ave., in Forest Grove. The event will include speaker Robert Ferguson, and a bagpipe performance by Robin Scott. The Beaverton American Legion Post No. 124 is hosting an event in the Beaverton Veterans Memorial Park located on 7th Street and Watson Avenue. The event begins at 11 a.m. with flyovers, music, POW/MIA Ceremony, Howitzer Salute, and much more. The American Legion Post 90 is hosting an event at Union Point Cemetery on Northwest Banks Road on Monday, May 28, at 11 a.m. There will be a presentation of colors before a speech from a local pastor, and a closing with rifle salute and taps.